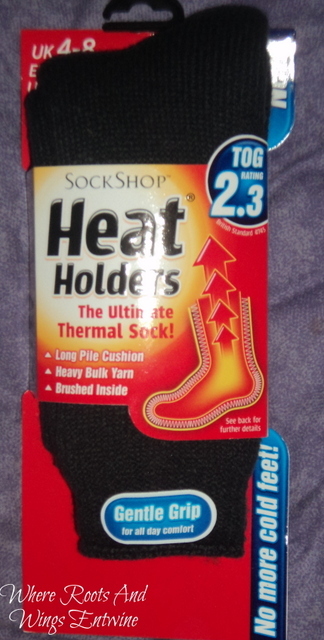 Where Roots And Wings Entwine: Heat Holders original socks review. Heat Holders original socks review. I have always suffered from cold feet, no matter what socks or slippers I wear they never feel warm especially when we are experiencing cold, wintery weather my poor little feet can feel like blocks of ice. Lee often complains when we are snuggling that I feel cosily warm everywhere expect my feet and if my icicle feet touch him they send cold shivers through his body. As my cold feet can disturb our cosy cwtches Lee was keen for me to review a pair of Heat Holders socks when he heard that they boast the claim of being “the ultimate thermal sock”. Heat Holders socks have a 2.3 tog rating and are claimed as being “7 x warmer than a basic cotton sock”. 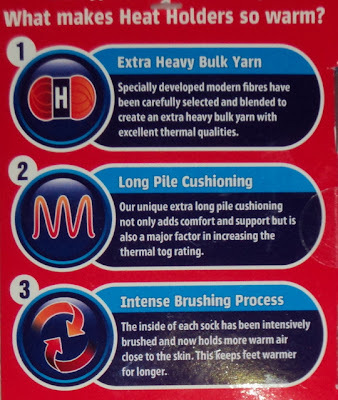 The socks are made using specially developed fibres that have superior moisture-wicking abilities (moisture is drawn away from the skin to outside of the sock rather than collect in-between the skin and sock). The specially developed advanced yarn keeps feet dry and insulated. * Long Looped Thermal Pile. The socks are made using an innovative knitting technology that creates a long looped thermal pile that is designed to trap warm air inside of the socks, which keeps feet warmer. 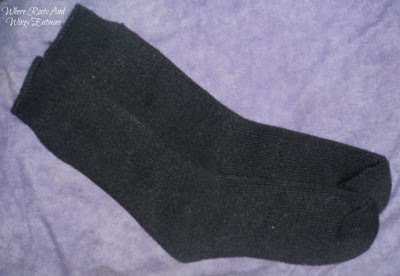 Inside the socks is a soft brushed yarn that provides additional warmth and comfort. With the miserable weather we have been experiencing lately; pouring rain, bitterly cold and abundance of windy weather and now the threat of ice and snow my feet have been feeling icy cold and my little toe which I broke a few years ago has been aching with pain due to the cold penetrating my feet. As my feet have been suffering and feeling wretchedly cold I was hoping these new socks would help banish the cold and keep my feet warm. The socks are well made and are of a high quality. When I first slipped my feet into the soft socks, my feet felt snug and the incredibly soft inner quickly melted my cold feet so that they no longer felt like blocks of ice. 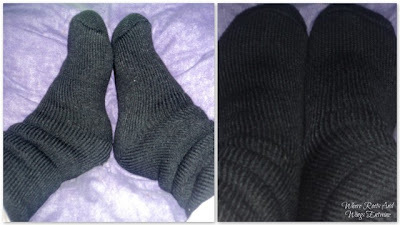 Wearing these socks my feet no longer feel cold, instead my tootsies feel warm and toasty. The incredibly soft inner helps my feet feel comfortable and snug, pampering my feet with cosiness and warmth. As well as being comfy to wear thanks to the soft inner the gentle grip cuff means they are comfortable to wear and are not constricting. The socks are quite thick and as such when wearing them with boots to keep my feet warm when out and about they are a very tight fit. Even though it is a snug fit to wear them with my boots, the times that I have done so when it has been bitterly cold outside my feet have remained warm and protected from the cold outside. As they are perfect for keeping the cold at bay, they have become my must have pair of socks to wear when going for long country walks with little man. Even though they keep my feet warm thankfully they have not made my feet sweat, leaving them warm and completely dry. I would highly recommend the socks as they encase my feet in soft, snug warmth they have provided brilliant insulation and prevented the cold from penetrating. Heat Holders socks cost from £7.oo per pair for adults socks which I initially thought was a tad expensive for socks but after using them and being impressed with how warm they keep my feet I think they are worth every penny. The socks are available in adult’s sizes (both men’s and women’s) and are available in a variety of styles; original, long, slipper and stripe, and in the women’s range there are also Wellington boot socks available. These socks are also available in children’s sizes (costing £5.00); both younger (UK size 9-1½) and older (UK size 2-5½). As well as being available in a range of styles and sizes there are a variety of colours to choose from. Their range of Heat Holders products also includes Graham Bell ski socks, hats, gloves, thermal underwear, tights and leggings. As I have been impressed with the original socks I think I will have to try a pair of their leggings as I always that even though leggings are super comfy to wear they can leave my legs cold so I tend to avoid leggings during cold weather and if the socks are anything to go buy Heat Holders leggings may be the perfect solution allowing me to wear leggings regardless of the weather. More information about Heat Holders.